This is the final plein air painting I did on our trip. We stayed at a B&B out in the woods-2 miles down an unpaved road! It's called the "Coyote Blues Village, " and is owned and run by a Swiss couple, which means the breakfasts are huge. I painted the view from our terrace. 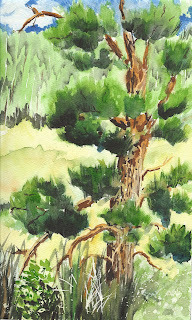 It was pine trees and fields in all directions. I saw a deer while I was sitting here, but he moved a little too quickly for me to paint!